Those who are lucky enough to share their lives with a cat know there is nothing better than spending these cold winter nights with a feline friend curled up on your lap. 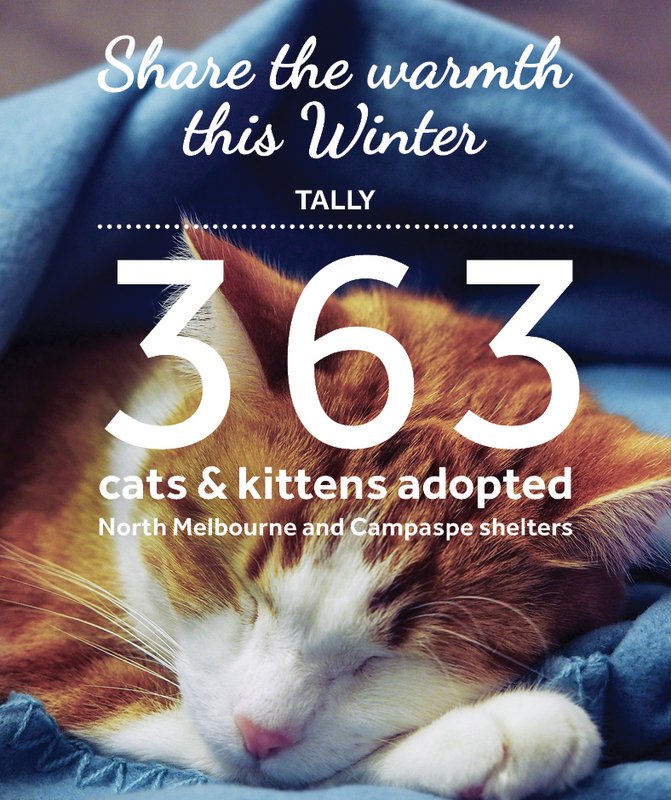 Last week, another 57 cats and kittens were adopted from our North Melbourne and Campaspe shelters, bringing the total number of felines adopted during Share the Warmth to 363. There is still a large number of cats and kittens looking to Share the Warmth with you this winter. With such a variety of personality types, you are sure to find a fantastic feline who is a purrfect match for you! Below are some of our long-term residents. They have watched their fellow felines move out into new homes, and they hope it will be their turn next! Bosco has been seeking a home for 154 days! This bright and bubbly feline is looking for a home where he will be able to play to his heart’s content. He has an adventurous nature and likes to investigate his surroundings. 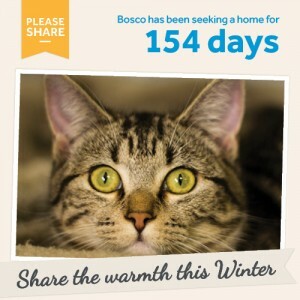 Bosco is a lovely young cat who has lots of love and affection on offer. He has such a positive outlook on life and will make a wonderful addition to the family. To learn more about Bosco, view his adoption profile or contact the team at our Campaspe shelter. Lion King may not be a king in the literal sense, but he would love nothing more than to find his own castle with a family that will treat him like royalty. He has been patiently waiting to find a new home for 91 days. 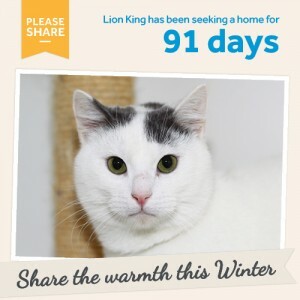 Lion King is a smoochy cat who certainly has a lot of love to give. Due to his delicate pink nose and light colouring, Lion King requires an indoor lifestyle to protect him from the sun. To learn more about Lion King, view his adoption profile or contact the team at our North Melbourne shelter. 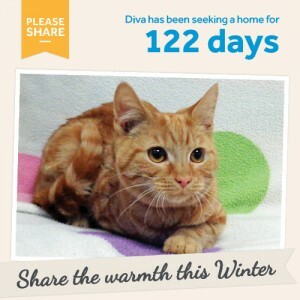 Diva has been seeking a new home for 122 days! Diva is a real go-getter with a great sense of exploration. She likes to investigate – especially when it involves toys! For Diva, there is always something new to explore and fun to be had. Diva’s antics will bring lots of laughter and entertainment into her new home. She is looking for a forever family that will enjoy being lavished in her love and affection. To learn more about Diva, view her adoption profile or contact the team at our Campaspe shelter. Until June 30, there will be no adoption fee for adult cats aged six months and over, and 50 per cent off the adoption fee for kittens less than six months of age. Please note: Renters will need to provide a Rental Agreement showing approval to keep a cat. To receive the discount, you will need to complete our Pet Licence Test at our shelter or online. • Adopt: View our terrific range of cats and kittens at dogshome.com or visit your nearest shelter to meet them in person — our staff are keen to find you your perfect match! Remember you will need to complete your Pet Licence Test to take advantage of these offers. • Foster: We need fosters to care for cats and kittens for an average of two to four weeks. This is a terrific way to give a cat time out in a normal home environment, while creating vital space at our shelters. All expenses are covered and successful applicants will be notified within two weeks of applying. For more information visit our foster care page. • Advocate: If you cannot adopt, why not advocate for a cat currently seeking a home? Share adoption candidate profiles via your Facebook page, email or via the good ol’ word of mouth!